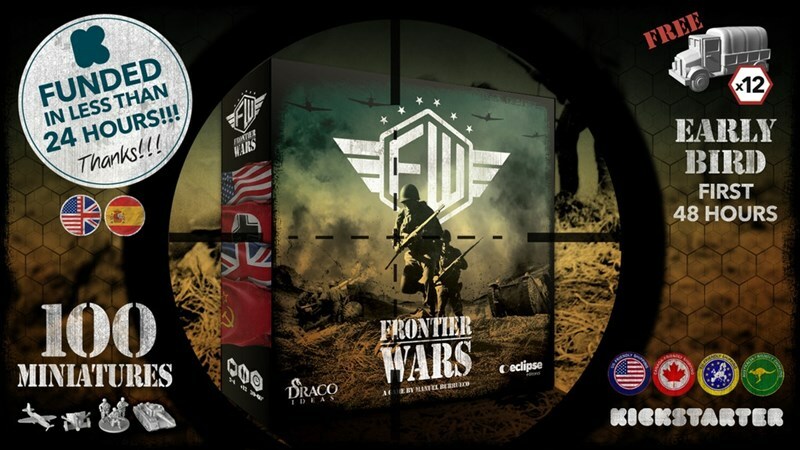 Draco Ideas has launched their Kickstarter campaign for Frontier Wars. Take on the role of one of the major nations involved in WWII and fight for your way of life. The game mimics real-time strategy play as you build up your armies and send them out to the front. "Frontier Wars" puts you in charge of one of the WWII factions: United States, Great Britain, Germany or the USSR, represented by 100 miniatures (included in the box). Offering an experience similar to computer real-time strategy RTS games, you must conquer new territories through battle, build new constructions that allow you to recruit new troops and build armies, and manage your cards (resources) to achieve victory. You may also acquire the Expansion and choose from two new very different factions: Japan and France, with 50 new miniatures, and the possibility to play with 5 or 6 players. This expansion also includes a new type of tile, double tiles. And it will also include new additional scenarios. The campaign is double its funding goal with still 28 days left to go.